Ibiza (Eivissa) is the third largest of the Balearic Islands, an autonomous community of Spain. Ibiza, with its beautiful sandy beaches, its lush green hills and sizzling nightlife, is a sought-after holiday destination. Ibiza’s main municipalities are Santa Eularia des Riu, Sant Antoni de Portmany and Ibiza-town. Spend a lovely day on the beach, enjoy Ibiza's famous beach clubs and watch breathtaking sunsets. Residence Royale selected a large number of luxury villas and holiday homes, all close to the beach and often with spectacular sea view. 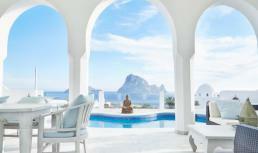 Villa Horta is for rent near Cala D’Hort on the western coast of Ibiza, only 5 minutes from the beach. The well-known beaches of the western coast like Cala Carbo, Cala Vadella and Es Cubells are only 10 minutes away. 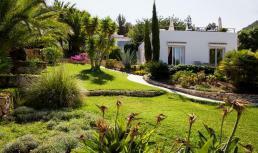 Wonderful holiday villa for 10 with 5 bedrooms, 4 bathrooms, private pool, internet, air conditioning and sea view!